Drivers paying a toll on Interstate 66 inside the Beltway can save a significant amount of money by just leaving a few minutes earlier or later, a new study finds. WASHINGTON — Drivers paying a toll on Interstate 66 inside the Beltway can save a significant amount of money by just leaving a few minutes earlier or later. New hour-by-hour breakdowns of average toll rates for the first six months show the lowest morning toll rates are before 6:30 a.m., with average prices paid quickly increasing after that. The breakdowns by time of day only tell part of the story though, since the rates also fluctuate significantly based on the day of the week. 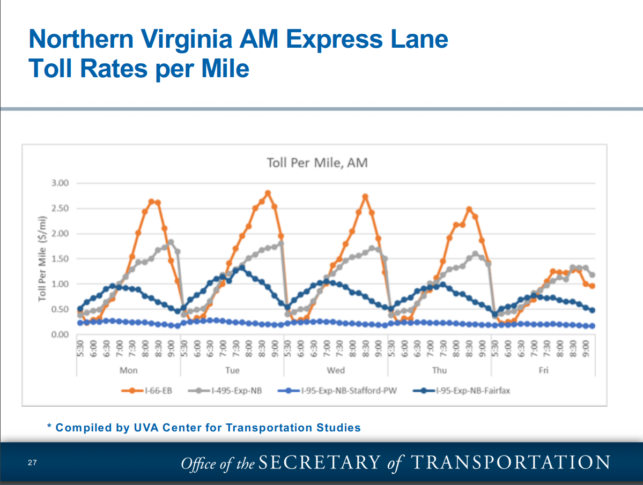 On Fridays, when telework is popular and other workers might take off for a long weekend, morning toll rates level off around 7:30 a.m. rather than spiking as they do on other weekdays, a University of Virginia Center for Transportation Studies analysis found. The peak of that cost-per-mile spike — around 8:30 a.m. — is highest Tuesdays and Wednesdays when toll payers have seen an average charge of about $2.75 per mile. In the afternoon, there are less dramatic differences in toll rates per mile based on day of the week, but the top rates seem to be generally higher on Wednesdays and Thursdays between 4:30 p.m. and 6 p.m.
Each day, the tolls rise to about $1 per mile around 5 or 5:30 p.m. Afternoon tolls start higher than that around 3 p.m. before quickly dropping for an hour or so, possibly due to the many drivers trying to get past the Beltway before HOV or toll rules begin. 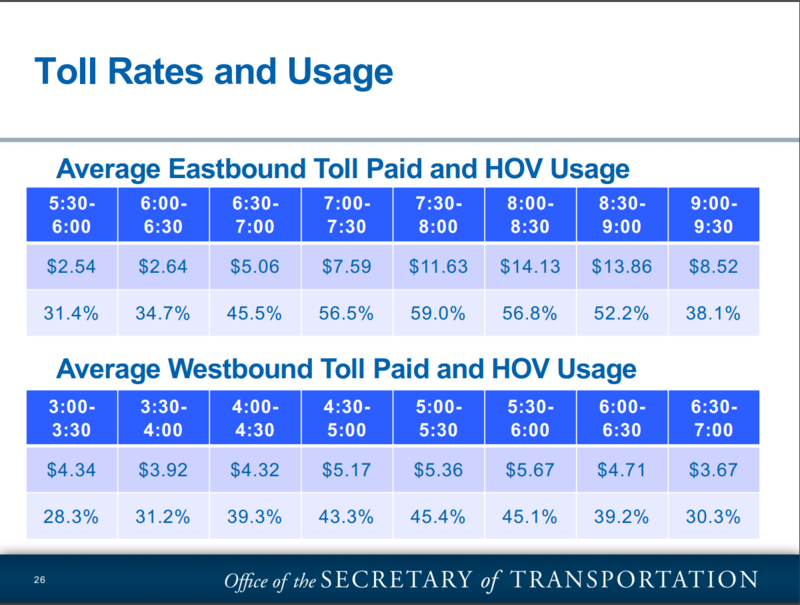 The average morning tolls paid by solo drivers or those without an E-ZPass on Interstate 66 inside the Beltway (including for trips on only part of the corridor) are $2.64 or lower before 6:30 a.m. when HOV hours used to begin. Between 6:30 a.m. and 7 a.m., the average toll paid rises to $5.06. It is the first part of a consistent rise through about 9 a.m., a data review presented by Virginia’s Office of the Secretary of Transportation said. Interstate 66 average toll rates and usage broken down by time. Between 7 and 7:30 a.m., the average paid is $7.59. It rises to $11.63 between 7:30 and 8 a.m. and peaks at $14.13 between 8 and 8:30 a.m. The rate remains relatively flat most days until around 9 a.m. when the average falls in the last half-hour of tolling to $8.52. The proportion of vehicles riding free with an E-ZPass Flex in HOV mode, and at least two total people inside, also rises over the course of the morning. It increases from 31.4 to 34.7 percent of cars from 5:30 to 6:30 a.m. then to 45.5 percent between 6:30 and 7 a.m. It remains over half of all vehicles on the road until a sharp drop off after 9 a.m., the old end of HOV hours. HOV usage in the afternoon is highest during the old HOV hours of 4:30 p.m. to 6 p.m. when it tops out around 45 percent of vehicles on the road. It is as low as 28.3 percent between 3 p.m. and 3:30 p.m. Afternoon tolls peak around 5:30 p.m. In the afternoon, average tolls paid have a less consistent trend. When tolls and HOV rules kick in at 3 p.m., the average toll paid is $4.34. That remains relatively similar through 4:30 p.m., although there is a slight drop between 3:30 and 4 p.m. The highest average toll rates in the afternoon are between 4:30 and 6 p.m., with a peak half-hour average of $5.67 between 5:30 and 6 p.m. The lowest afternoon tolls paid on average are at the tail end of the rush hour rules, $3.67 between 6:30 and 7 p.m.